This attachment was specially designed to condition windrowed sod peat by screening out mould and exposing fresh sod surfaces to the sun and wind. The attachment comprises three small screen bar elevators spaced to suit windrows at 1.5 metre centres. While maintaining the correct spacing, the elevators are located one on either side of the tractor unit towards the rear and one in front of the tractor in the centre, maintaining the overall balance of the tractor. The elevators consist of a light frame of simple construction fabricated from square hollow section steel. 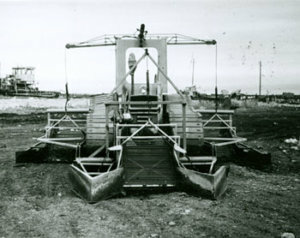 The elevator frames are pivoted to the super structure on the tractor so that the elevators carried on ground rollers at the lower end follows the bog surface. The screen bar chain as used on potato harvesters is driven by sprockets at the top and passes over small diameter plain rollers at the bottom. The transmission is taken from the standard tractor P.T.O. Shaft via ‘V’ rope drives, cardan shafts, standard Ferguson bevel-boxes and chain drives to the elevator top shafts. The elevators are lifted hydraulically for idle travel.